One of the reasons I bought a Pocket PC was that I wanted to be able to read eBooks on a PDA. So when my Dell Axim X51v arrived I had to find an application that made it possible to read files in the portable document format (PDF) since none was included with Windows Mobile version 5. I decided to give Adobe's PDF reader for Windows CE a try first. Sadly that turned out to be a huge disappointment to say the least. Next attempt was a free beta of Foxit Reader for Pocket PC, but sadly that program crashed a lot on some files I tested it with. Since it has been a while I can't recall which of the two PDF readers I tried was worse overall. ... a no-frills viewer for native PDF files for the Pocket PC platform. The rendering engine is a port of Xpdf. 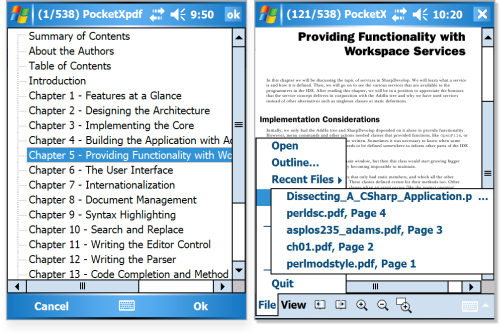 PocketXpdf has been tested on an ASUS MyPal running Windows Mobile 2003 and on a Dell Axim X51v running Windows Mobile 5. Since I have been using PocketXpdf for several months now, today I decided to write a short review of PocketXpdf version 0.5.0 running on my Dell Axim X51v. Opening a file for reading with PocketXpdf can either be done by double clicking on a PDF file, or using the Open entry in the File menu after the program has been started. The latter opens a file browser with in my experience an odd limitation: it does show the PDF files in sub folders of the SD card I use to store my eBooks but it doesn't show any PDF file located in folders inside a sub folder. I have the feeling that this limitation is caused by the standard file browser component PocketXpdf uses instead of the program itself. Viewing a PDF file with PocketXpdf on a Dell Axim X51v. When I have opened a PDF file I use the Drag Zoom option to draw a rectangle over the text but not too much outside the text. This makes PocketXpdf zoom the text out in such a way that it fits inside the window. Note that it's easy to get a "Not enough free memory to zoom in that close." warning this way. So far I have been able to get the zoom setting I want by killing a few running programs and try again. Drag Zoom can be initiated by clicking the icon representing a recangle with magnifying glass or by selecting the Drag Zoom option in the Zoom sub menu of the View menu. I prefer to read in landscape mode. I use the capabilities of Windows Mobile 5 to rotate the screen. Since somehow this stops XnView Pocket from taking a screen shot I used the Rotation sub menu of the View menu to rotate the document 90 degrees counter clockwise in the above screen dump. A document outline (left), and bookmarks (right), PocketXpdf on a Dell Axim X51v). If you're lucky the "Outline..." entry of the File menu is available because of the PDF file supporting this and you can see an overview of the contents of the PDF file and quickly select a chapter or section. PocketXpdf supports 5 slots for bookmarks which is too few in my opinion. Bookmarking is quite easy, just select a slot in the Save submenu of Bookmarks in the File menu and that's it. The filename and the page number of the PDF (not the actual page number displayed on the page itself) are recorded. Note that if the filename is too long to fit in the slot, only a part of the filename is displayed and the page number is omitted. Loading a bookmark makes PocketXpdf load the right file and jumping to the right page. The rendering of pages takes between 1 and 2 seconds. To me this is quite acceptable. The low number of slots available for bookmarking (five). The vertical scrollbar isn't being moved to the top of the page when one navigates to the next or previous page by tapping the navigation icons or the Next Page / Previous Page in the Navigation sub menu. The file browser doesn't display PDF files located in a sub folder of a sub folder. After removing Adobe Reader for Pocket PC off my PDA I suddenly couldn't transfer PDF files anymore via Microsoft ActiveSync. Might have been my mistake, I mean I can't recall how and if I uninstalled the program from my PC as well, but I had to delete an entry from the registry to fix this issue other then changing the extension and changing it back after copying the file via Microsoft ActiveSync. perldsc - Perl Data Structures Cookbook - perldoc.perl.org, has a link to the PDF version. 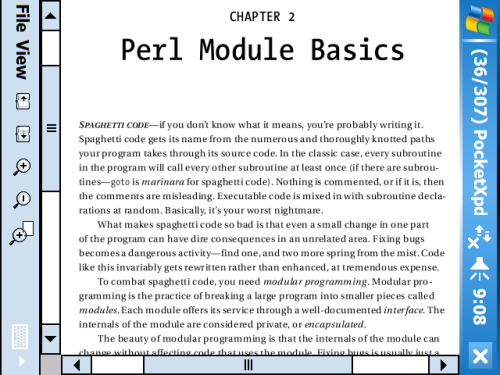 perlmodstyle - Perl module style guide - perldoc.perl.org, has a link to the PDF version.